This seems like a perfectly nice looking park on 95th Street. So why does no one ever use it? Perhaps it has to do with the surroundings. Nothing around here is generating any significant amount of pedestrian activity that will lead to people lingering in this park. The same goes for this one on Western Avenue. “In orthodox city planning, neighborhood open spaces are venerated in an amazingly uncritical fashion. Ask a houser how his planned neighborhood improves on the old city and he will cite, as a self-evident virtue, More Open Space. Ask a zoner about the improvements in progressive codes and he will cite, again as a self-evident virtue, their incentives toward leaving More Open Space. Walk with a planner through a dispirited neighborhood and though it be already scabby with deserted parks and tired landscaping festooned with old Kleenex, he will envision a future of More Open Space. She could be talking about these two parks in Beverly (well, maybe the mugging part doesn’t apply). Before we start adding gathering space, we should think about how it will actually function in the current environment. If you have a lack of pedestrian activity in a place, your park will be perpetually vacant. A park alone does not make a place. Get the place right first, then think about enhancing it with a well placed park. The park is located near 106th and Western in the Beverly neighborhood. It features a statue of a firefighter…. Numerous residents, including myself that live in the area were there that horrible evening. I believe it to be a beautiful reminder of these Two Brave men who lost their lives that night. A reflection park, where I often see people of all ages. I think the one at 95th and Winchester which is right next to the Library as well as 106th and Western are places to sit read and just be. You can tune out the noise of traffic and be at peace. They both are kept up and look 100% better than the concrete waste that was there before. Thank you for your comment and filling me in on local history! I’m certainly not disputing the beautiful sentiment behind King Lockhart Park — memorials to our local heroes are part of what add to the quality of a neighborhood. And I agree, that these are places to simply just “be.” Neighborhoods need these kinds of places in addition to more “active” parks. But in order to just “be” in these places, a person as to either walk around an environment that is not very pedestrian-friendly or drive to them. 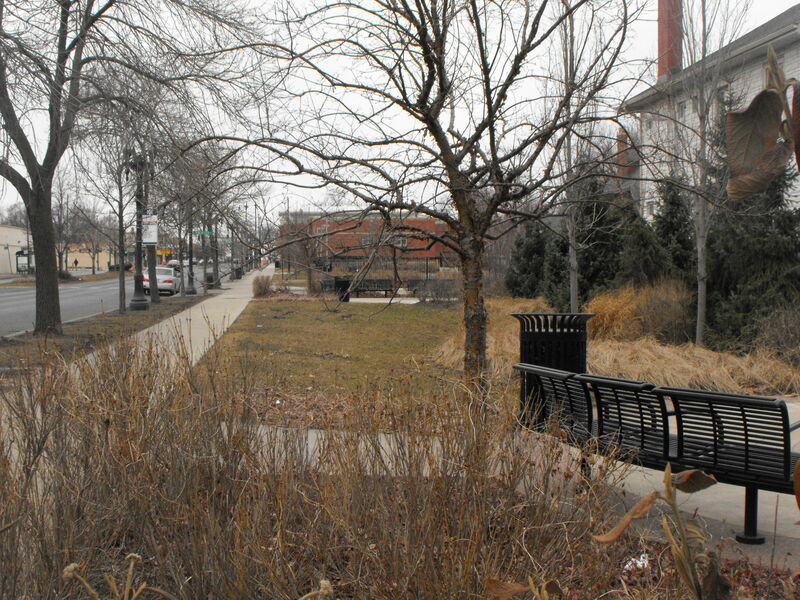 They are similar to the “green space” at 111th and Kedzie in Mount Greenwood, which also has a very nice sentiment behind it but is ultimately in a place where it doesn’t add a lot of value to the sense of place. The park on 95th Street is adjacent to a cul-de-sac and parking lot on one side (dead space) and another parking lot on the other side. What if the parking lot and park were swapped so people walking out of the library could sit outside and read? That to me is a much more valuable public space. King Lockhart Park sits between a parking lot and a space that will soon become Buona Beef’s parking lot. To me, gathering spaces that are placed in areas where pedestrian activity naturally occurs are more functional. They enhance the surrounding businesses while the traffic from the businesses enhances the park. I work across the street from King Lockhart park and see people there with their dogs every day (and night). I don’t have a dog but I don’t think there are any nearby dog parks.